Under the increasing serious concern on climate change, the problem of food security has been paid more attention by governments and food institutions, and agriculture is one of the most serious influenced field among this case. There are a series of effects due to the climate change, for instance, it will keep a decreasing trend in crop productivity and it will crash to food availability;rising food price will cause an unstable production chain in agriculture area; food safety will be shocked, and therefore there will be some hunger as well as undernutrition; and it will pose a threat on biodiversity, what is more, it will also increase the impacts of pests, which threaten agriculture, aquaculture, fisheries and forestry production. Some scientists claimed that climate change has more disadvantages than advantages for food security. And although carbon dioxide has positive impact on land force, the adverse aspects will offset the advantages. For instance, Gregory et al. (1999) showed researches when wheat reduce their duration for mature at meanwhile wheat yield will be reduced. It is likely to offset the increased yield on a deep degree due to the increasing carbon dioxide (CO2), so the effects of temperature are more likely to be considered significant harmful. Several reviews (e.g. Amthor 2001; Fuhrer 2003) have further summarized the potential consequences of climate changes on crop plants yield and concluded that the benefits of carbon dioxide during the earlier-anticipated would be offset by pollution, serious related climate effects as well as nutrition limitation. Similarly, some institutions from Africa and Latin America used the Had CM2 model to anticipate the climate dates and as a consequence, it will be decreased by 10%, as the most generate characteristic daily weather data. While as the most directly influenced aspect, crop productivity will be changed a lot, especially on the stability as well as availability. Furthermore, climate change will put impacts on agriculture and crop productivity in complex ways. The weather condition in global and regional areas are expected to changed largely, with more frequent extreme events, including cyclones, hailstorms, floods and droughts. 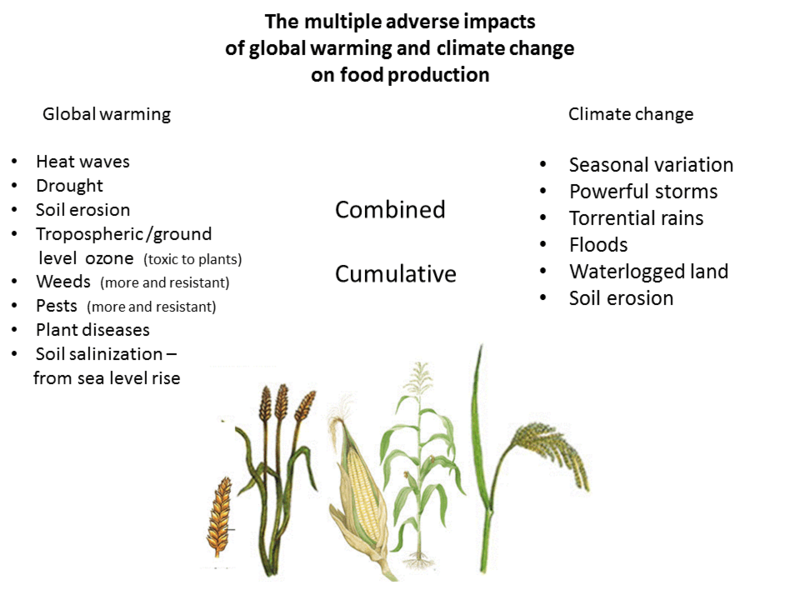 These effects including fluctuations in food supplies as well as crop outputs, higher risks of landslides, erosion damage are more likely to put a threat to the food supplied stability, and therefore, there are some crises on food security. Moreover, if there would be an increasing number of population while climate change would reduce production, there is more likely to be hunger, even there will appear food crises such as food supplied shortage and urban riots. Particularly, different counties and regions rely on their own circumstances. As for those areas which are considered as the most important developing countries in the tropics, their temperatures and humidity are expected to rise from already high levels, and their productivity of workers is expected to fall without a reasonable calculate measures. Valenzuela（2011）made some statistical results that the agriculture outputs in developing countries are likely to shrink by no more than 2% in 2030. And he supplied that there are some larger adverse effects in the low-productivity countries, for example, agriculture outputs in Indian and Sub-Saharan Africa will fall respectively by 5.6% and 6.5%. By contrast, the temperature of high-income countries will be a cool or moderate state rather than a high level as nowadays. It is worth mentioning that food security will be affected by individual income and countries’ economic basic. As one of the most important corollary, national self-sufficiency is not necessary for individual to insure their food security. According to Schmidhuber (2007), although Hong Kong and Singapore are not self-sufficient countries, their populations are food-secure, while India is a self-sufficient country but its majority population is not food-secure. The second adverse aspect from climate change is farm product price, which is direct with crop productivity and has a further influence on the whole farm production chain. Recent years, most food institutions and International food organizations, as well as amount of researchers have been studying this issue. Especially, Valenzuela（2011）put their study on the aggregate agriculture products price (except the high productivity case ) of international markets that it would be higher in 2030. Besides, he added that the most extreme change will be for coarse grains (mostly maize), whose price is anticipated to be 16 percent higher in the low case at the same time 4 percent higher in the medium case. While, there are some higher results from other studies. For instance, in a recent IFPRI study from Nelson et al, product price effects of climate will be changed between 20 and 50 percent in 2050. (Nelson et al, 2010). The most serious question that should be paid more attention by the government or institution is the chain reaction, relating to food crises. Third, under climate changed, there will be much graver hunger and undernutrition in the future. Hunger includes many different aspects, even including deficiencies in micro-nutrition, short-shocks on food access and chronic shortage. Wheeler (2013) suggested that the causes what lead to poor health are the supply limitation of the sufficient quality as well as quantity’ food and the adequate purchasing power to nutritional sanitation as well as infectious disease. Even currently, some regions are facing to hunger and undernutrition seriously. From other relevant indicators of nutrition, such as child underweight, however, there is an estimated by a health institution that 2 billion people still suffer from micro-nutrition adequate situation today. With the increasing number of population and decreasing number of crop productivity, this issue will be serious go further and tracking hunger has been one of huge challenges in this era. For example, demand for crop production is expected to increase by around 50% in 2030 since the global population is increasing, which will require government to put toward a shift on the new sustainable food systems. The last effect of climate change is for increasing the tolerance of pests, and reducing plants power of tolerance as well as resistant to pests and diseases. It is likely to be easier for increasing temperature to expand the range of agricultural pests and increase the pests’ ability to survive in the winter and damage the crops in the spring. Hoping to reduce adverse effects of pests, governments have to create and use some new methods to reduce the pest population. And in past few years, human would like to use some chemistry method such as pesticides. However, owing to the natural selection, those harmful insects and related elements including fungi or bacteria are more likely to be resistant to pesticides. However, due to understand the significance of resisting pesticides, government have to find other new methods to control the pests such as biological control, which there are also some arguments that it will put a threat on plants health and ecological unbalance. In Europe, some discussions appeared that climate change creates serious emerging risks to plant health. And European Food Safety Authority (EFSA) and European and Mediterranean Plant Protection Organization (EPPO) have supported plant health legislation in European Union. Although there are some proponents hold the view that climate change could have some benefits on crop production, there are also more opponents suggest that the threats from carbon dioxide will offset the increased yield on a deep degree at the first time, and climate change is likely to reduce the crop production for a further time, raise the farm product price, lead to the issues on hunger and undernutrition and increase the pests’ tolerance while reduce crops’ tolerance in the future. After understand these issues between climate change and food security in the future, governments or related organizations have to take some actions and put a shift on food system. Previous Previous post: How about crickets for today’s lunch? !